A beach – often casts an unseen magical spell on everyone and a beach wedding is a very innate desire cherished by most human beings. Personalized 4x 6 inch shore save the date square corner magnets can trigger the same desire of attending an interesting beach wedding within a viewer. 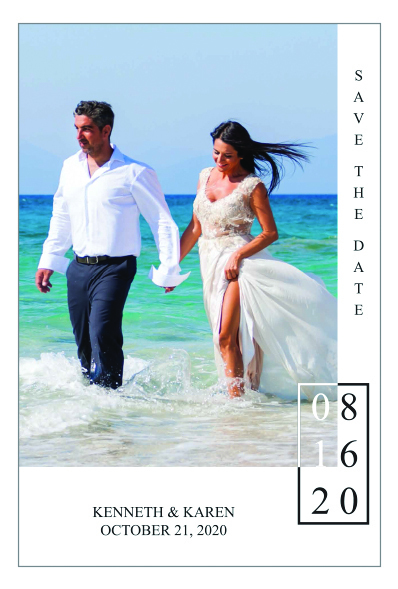 Whoever sees customized 4 x6 inch shore save the date square corner magnets will only think about the interesting time they are about to spend with couple. Post- wedding it will be retained as a souvenir of a great beach wedding. Product Size: 4i n. x 6 in..